Программа Shengjing Шань Академия Кунг-фу Обучение Ежедневное расписание с понедельника по пятницу 06:00 - 7:00 Tai Chi и цигун 07:00 - 8:30 Завтрак 08:30 - 1..
1 Month Kung Fu, Qi Gong, and Tai Chi Training in China..
Программа обучения Ван Чжи Ping Tai Chi школы Программа Эти программы, чтобы дать студентам представление о том, чего ожидать. Обучение в школе осуществляется на индивидуальной основ..
Яншо Tai Chi Школа Расписание обучения Тренировочные раз в Яншо Тайцзи школы может варьироваться в зависимости от текущего сезона. Ниже приведен пример график обучения школы. 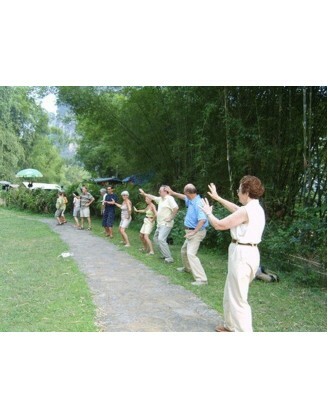 План обучения или р..
1 Month of Tai Chi at Yangshuo, Guanxi Province, China..
Программа Цюйфу Шаолинь кунг-фу школы Программа в течение месяца или меньше времени регистрации Когда вы приходите в школу, вы будете учить основные навыки кунг-фу: Аутен..
1 Month Shaolin Kung Fu and Tai Chi in Shandong, China..
Абсолютное Китай туры Tai Chi и культура Программа тура движения цюань Tai Chi Tai Chi Quan предлагаются плавные и последовательные движения, совершенное смешение твердости и мягкости, нежной и гибкой жес..
1 Week Authentic Culture Tour and Tai Chi in China..
Программа обучения Цюйфу Шаолинь кунг-фу школы Программа в течение месяца или меньше времени регистрации Когда вы приходите в школу, вы будете учить основные навыки кунг-фу: ..
Tai Chi подготовки учителей в Греции Taichi праздники приглашает Вас присоединиться к их тайцзи Преподаватель учебного курса в Халкида, Греция, с мастером Кен Bone. Это шанс, чтобы начать свой собственный Tai Chi и цигун путешествие в к..
1 Week Tai Chi Qigong Teacher Training in Greece..
1 неделя Tai Chi Обучение в Таиланде Tao Garden Health Резорт и Спа Tao Garden Spa Health & Курорт является домом Мастер Мантэк Чиа, который научил Всеобщую Healing Tao системы по всему миру тысячи студентов. Ежегодно отступлений проводятся в..
1 Week Tai Chi Training in Thailand Tao Garden Health Resort and Spa..
Taichi праздники Tai Chi и даосская йога программы На следующее утро тренировочные занятия начнутся с 08:00 до 10:00. Программа сопровождается свободное время, чтобы насладиться окрестностями. В..
1 Week Tai Chi Winter Training Camp in Greece..
Рост Обучение Дракон кунг-фу в программе Китая На RDS вы будете тренироваться около 6 часов в день с отдыха / свободное время в выходные дни. Обучение начинается каждое утро в 05:30, так что бол..
2 Weeks Tai Chi, Qi Gong, and Kung Fu Vacation in China..
Программа Kunyu Mountain Шаолинь боевых искусств Академии Все студенты приветствуются Мы предлагаем инструкции для начинающих и продвинутых студентов с предыдущим опытом боевых искус..
3 Months Learn Kung Fu, Qi Gong, Tai Chi in China..
Программа Китай Siping Шаолинь Боевые искусства Академии Типичный график Обучение Боевые искусства 5:30 - 07:30 Упражнения и тренировки 07:30 - 8:30 Завтрак ..
3 Months Tai Chi & Shaolin Kung Fu Training in China..
Программа Shongshan Шаолинь ушу Традиционная китайская Академия боевых искусств Школа Расписание тренировок В теплое время года занятия начинаются формально в 5.30 утра, в то время к..
Средний Королевство кунг-фу и Wellness Школа боевых искусств в Китае программы График 06:00 - 6:45 Разминка обучение кондиционирования / прочность 6:45 - 7:45 Tai Chi / Q..
4 Months Qi Gong, Tai Chi & Kung Fu School in China..
Инструкторы Инструкторы в Yagshuo Tai Chi и Кунг-фу школы живут и тренируются в школе, 24/7. Они прошли обучение и обучение в школе в течение 5 лет и более. Мастер Фу, которому принадлежит школа..
4 Weeks of Tai Chi in Yangshuo, Guanxi Province, China..
Taozi, in about the fourth century B.C., wrote the Dao de Jing (Tao-te Ching), a text explaining the Dao, the nature of things and underlying principles. Through applying the principle of noncontention, one learns to master others. Others labeled as contributors to the philosophic transmission include the philosopher Fu Xi, and even the reclusive poet and explorer of mysterious powers, Xu Xuanping of the Tang dynasty (a.d. 618-907). Another famous Daoist, Zhang Sanfeng, is said by many to have been the actual founder of taiji. What is confusing is that records from Wudang Mountain, a stunningly beautiful place that has been the center of Taoism since the seventh century, include two Zhang Sanfengs—one from the twelfth century and another from the fourteenth century. Legends first written down in the 1867 Ma Tungwen manuscript, and adopted for many years by the Yang Family, credit Zhang Sanfeng as creator of taiji. In fact, most taiji manuals from 1921 on credit Zhang Sanfeng as the founder without research. According to legend, Zhang Sanfeng of the twelfth century was on the road while besieged by bandits and took refuge on Wudang Mountain. The spirit of Wudang Mountain came in a dream and taught him a new method of fighting, taiji, and he easily defeated a hundred bandits. The Zhang Sanfeng of the fourteenth century is said to have been a “mad” alchemist searching for immortality by observing tortoises and cranes, two long-lived creatures. One day he observed a crane and snake fighting, and from this graceful battle he came up with the Thirteen Postures of Taiji. Both Zhang Sanfengs have been the subjects of many popular books and motion pictures. 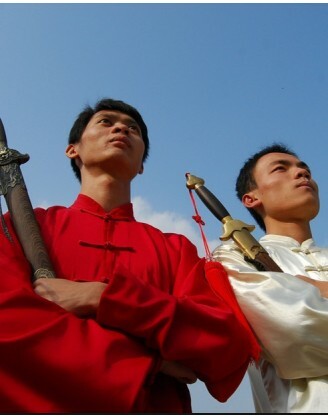 Both men combine the spiritual cultivation of Taoism with the skills of wushu, but historians have found no direct clear links. What is clear is a body of skills from Wenxian County, Henan province, that represents the beginnings of all major forms of taijiquan. This includes physical forms and training practices stemming from the seventeenth century and some clear writings and supporting historical data. Tang Hao (1897-1959), after research in the 1930s, determined that Chen Waugting of Chen Village created much of what we know now as taijiquan. A garrison commander in the 1640s, who successfully led his local troops into battle “beating back bandits” (Zhaohua Publishing 1984, 3), he was a famous and successful martial artist in his day. After the downfall of the Ming dynasty, Chen Wangting retired from warrior life and withdrew from society. According to a poem he wrote before he died, he did “field work when the season came, created boxing forms when depressed, and in leisure time taught disciples and children to be worthy members of society.” He also mentions the book Huang Ting, a Daoist text on breathing, mind, and movement (Zhaohua Publishing 1984, 3). In addition, a book by General Qi Jiguang, The Canons of Boxing, constituted a significant influence. The general lived a half century before Chen Wangting, and compiled a book from sixteen popular fighting styles. Twenty-nine of the thirty-two movements from the book are found in the various Chen Family routines, and the first two movements are the first movements of the Chen bare-handed forms. Chen Wangting’s contributions, which distinguish Chen Family boxing from external styles, include the yi lu (the long sequence that is the basis for traditional Yang, Wn, Hao, and Sun style sequences) and tui shou (push-hands, a type of sparring using light touch and redirection of force, developing greater efficiency and sensitivity). This type of sparring allows the development of important fighting skills without injury; it may also be applied to weapons, for example, “sticky” spear techniques. 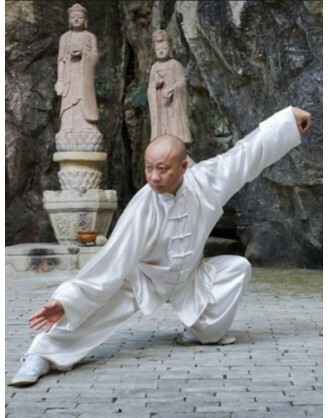 Chen Wang-ting’s other contributions are the incorporation of qigong exercises (called “silk reeling”), the use of spiraling movement, and the application of concepts of traditional Chinese medicine. Some recent scholars have suggested another source for taiji’s origin besides Chen village: nearby Zhaobao village and the mysterious Jiang Fa from Shanxi province, whose heyday was a quarter century before Chen Wangting’s. There has been a further attempt to link Jiang Fa back to Zhang Sanfeng. 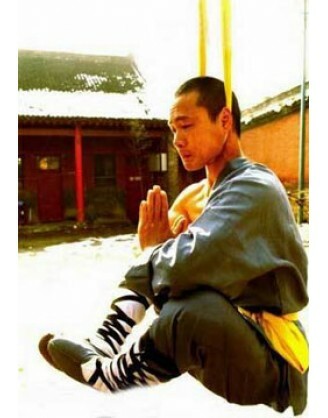 Whether Jiang Fa’s martial arts influenced Chen Wangting’s, or Jiang Fa had a relationship dating back to the well-known Daoist, most scholars agree that Wenxian County is the origin of the original routines and training methods. At the turn of the nineteenth century, a young man named Yang Luchan went from his home of Yongnian, Hebei province, to Chen village as a servant. There he learned taijiquan, and later returned home, where he became known as “Yang the Invincible.” Several of his students include the three Wu brothers, two of whom were local magistrates and scholars, Wu Chengqing and Wu Ruqing, and one a superior martial artist, Wu Yuxiang. All loved martial arts, and unlike Yang, were literate. Wu Yuxiang was briefly a student of Yang, and then, because Yang held back teaching, he went back to Chen village and Zhaobao village for training with Chen Qingping. Yongnian was a breeding ground for great martial artists, and this was a turbulent time. The eldest Wu brother found a text in a salt shop, attributed to Wang Zongyue from the turn of the nineteenth century. It was entitled A Treatise on Taijiquan. Prior to that time, taijiquan was referred to as Changquan (long boxing), or the Thirteen Movements. Wu Yuxiang, his brothers, and a nephew, Li Yiyu (and later Yang Banhou), worked on this manuscript to produce what are now known as the Classics. This body of work, consisting of approximately forty texts, expounds the philosophical and practical methods that most taijiquan schools claim as basic, common, and uniting. It includes, among other discussions, commentaries on sparring, the eight gates and five steps, the thirteen postures, the taiji circle, and qi circulation. Yang later moved to Beijing, taking a post with the Qing government teaching martial arts. He simplified some of the Chen movements. His sons, especially Yang Banhou, continued his work, and later Yang Luchan’s grandsons (from his son Jianhou), Yang Shaohou and Yang Chengfu, became famous for their skills, and their additions to the art, too. Yang Chengfu made the form smooth, large, and broad, popularizing it for young and old. 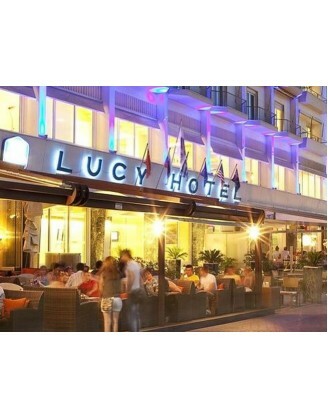 It is his style of performance that is most popular today internationally. His style is most often referred to as Yang Style, although there are still scattered pockets of people performing sequences that are attributed to earlier members of the Yang family. Back in Yongnian, Wu Yuxiang created what is now known as Wu (or Hao) style from his studies with Yang, his training with Chen, and his study of the classics. This style is compact, simple, small in frame, and quite upright. Li Yiyu taught Hao Weizhen (1849-1920). In the capital, Wu Quanyou, a Manchu by birth and a student of Yang Banhou, created an elegant, medium-framed style referred to as Wu (different character and tone from Wu/Hao). It was passed on through Wu Jianquan (1870-1942) and is also quite popular. Hao taught the famous Sun Lutang (1861-1932). Already a well-known martial artist at the turn of the century, the latter created a new style of taijiquan, Sun, incorporating xingyiquan (hsing i ch’uan) and baguazhang (pa kua ch’uan), which, like taijiquan, are considered internal arts based on similar principles. The Sun is a very distinctive style, still being taught by his daughter, Sun Jianyun, and gaining popularity. In 1928, Yang Chengfu traveled to Nanjing, Shanghai, Hangzhou, Guangzhou, and Hankou and taught taiji. This trip, plus the many people taught by the Yang Family in Beijing who migrated to other parts of the country, helped to popularize taijiquan throughout China. It was also in 1928 that Chen stylist Chen Fake (1887-1957) moved to Beijing and began teaching. By far the five most popular styles of taijiquan are Yang, Wu, Wu/Hao, Sun, and Chen. Other, less popular, styles include Five Star, Buddhist, and Fu Style. In the 1950s, the People’s Republic of China sponsored committees that designed easier, shorter forms to bring taiji, and especially its health effects, to the masses. The first of these forms is the Simplified Twenty-Four Form, based on the Yang form. It eliminates repetitions of sequences and cuts difficult movements. It takes only five minutes to perform, versus twenty minutes for the traditional form. Later forms include the Eighty-eight Movement Form strictly based on the Yang form, the Sixty-Six and Forty-Eight Movement Combined Forms with elements from the five popular styles, and Thirty-two Sword. Also, because of government sponsorship, taijiquan is an official division of sports wushu. Competition in forms, like the International Forty-Two Empty-Hand and Sword Forms, has become popular, and it appears probable that taiji will be a demonstration sport in the Olympics of 2008. As one effect of this government sponsorship, many traditional schools have changed training methods and are now using simplified shorter forms first, to encourage beginners’ progress. Some have even developed their own shorter competition forms. The results are evident, as taiji has gained tremendous popularity in China. Japan, Southeast Asia, Australia, Europe, the United States, and Canada have ever-growing numbers of taiji practitioners. Taiji is generally practiced as forms or sets consisting of a series of connected and continuous postures performed very slowly. The slow practice of the art results in technique becoming refined, balanced, and strong. Fast sets also are performed, but only in certain schools, and only after one has gained some degree of proficiency at the traditionally slow sets. Both empty-hand and weapons forms are practiced individually, but may be practiced with a partner as well. Training in push-hands is taijiquan’s form of sparring. It is the logical extension of the solo forms of taijiquan. The principles learned in taijiquan are applied in push-hands. Push-hands practice allows a person to perfect the ability to yield and to let go of all that is nonessential in any interaction or confrontation. 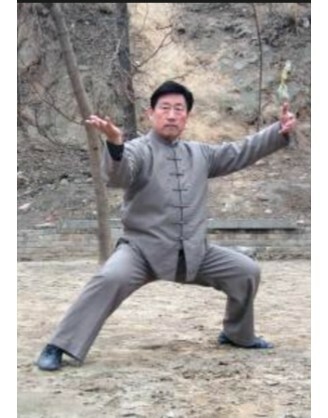 Other individual practices include Zhan Zhuang (Standing Post Meditation) and sets of qigong, including the popular Eighteen Movement Taiji Qigong. Some modern schools repeat individual movements as a set of basics. A few schools practice seated meditation and breathing exercises, which they later apply to forms. Although not all schools still teach weapons, as they have fallen out of favor, most traditional styles still retain the weapons as part of the curriculum. They are used at upper levels of skill to improve balance, coordination, strength, and the correct use of jin (force). The gaze of the eyes, with concentration (or focus), forms the yi (otherwise known as intention). This in turn directs flow of qi (internal energy), which in turn manifests as jing (physical force/action). Training in weapons clarifies the use of legs and waist, which reinforces the empty-hand training. Weapons are beautiful, and exhibit a power that demands attention and appreciation. All taiji weapons techniques have certain common denominators: continuity and smoothness, power from legs and waist, and “stickiness” once in contact with the opponent’s weapon. The major weapons include the jian, a double-edged straight sword. It is the most popular, but the most difficult of weapons to do well, and the favorite of aristocrats in years past. Quick, smooth, and accurate, it is said to be like a flying phoenix. The dao (broadsword or saber) is a curved single-edged weapon. Less sophisticated and more strength-oriented, it is the favorite of the common people. A chopping weapon, the dao is said to be like a fierce tiger. The gun (staff or cudgel) is a common weapon that uses powerful larger, sweeping, striking movements. The spear is a poking, stabbing, long-distance weapon, the major weapon of the common foot soldier in ancient times. Minor weapons show up in various styles and include the fan, a graceful, beautiful, and artful weapon of courtly life. The stick is a common walking traveler’s weapon. The fire wheel (or ring) is an old weapon making a resurgence in popularity. Taijiquan and the other internal martial arts, called neijia, are to be considered with the external martial arts, waijia, among the various styles popularly referred to as gongfu (other spellings include kung fu and gung fu) and wushu. Wushu refers to the martial arts of China in general (but it can be meant as a specific modern sport). This term is inclusive of taijiquan. Kung fu, though popularly and erroneously referencing the martial arts of China, in point of fact simply means “excellence.” The character for the word kung fu consists of the characters for time and energy. Though there is some dispute regarding the origins of the term internal martial arts, the internal martial arts have characteristics that distinguish them from the “external” styles, waijia. 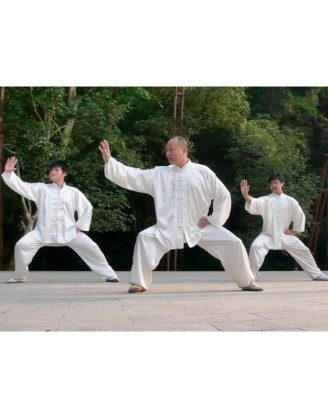 The “big three” internal arts, taijiquan, xingyiquan, and baguazhang, have the characteristics of being grounded, rooted, and balanced while expressing all techniques. 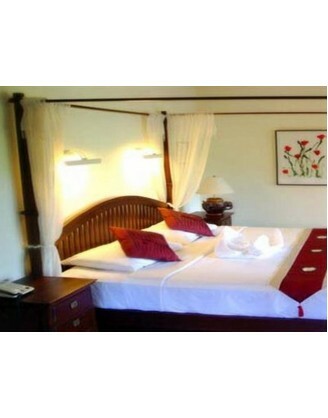 The emphasis is on relaxation, calmness, and control. Since these arts are shaped by Daoist philosophy, yin and yang are clearly distinguished and yet harmonized in all movement. The mind’s intention, yi, directs internal energy, qi, manifesting as force, jing. Striking techniques tend to inflict internal injuries, less conspicuous to the eye, as opposed to the more obvious externally apparent injuries of the external arts. 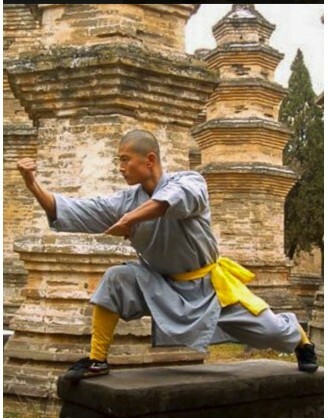 External martial arts are much more numerous, and they are often those associated with the Shaolin Temple, Buddhist origins, and India (i.e., a source outside China). The most profound difference is that external styles emphasize developing as much speed and power as possible through training the body. This training includes developing speed in footwork and learning long-range techniques and specific strategies and timings. Double weighting (distributing the weight equally on both feet) is a feature of the external school of martial arts, whereas double weighting is virtually taboo in the internal schools. The internal martial arts feature all of the techniques of the external arts, including punches, kicks, grappling (ch’in na), throws, breaks, locks, and sweeps, but the application of power is different. Taijiquan (sometimes translated as “grand terminus boxing”) is better adapted for short-and medium-range fighting than for distance fighting. This is in part as a result of its emphasis on utilizing the opponent’s own energy against the opponent. 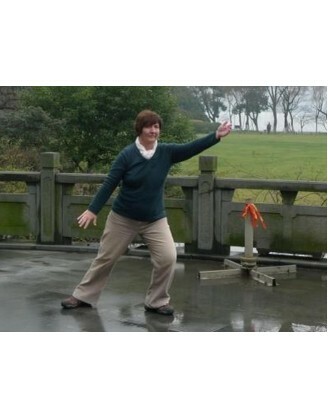 Taijiquan is composed of a wide range of styles, and many variations are evident even within each particular style. Yang Chengfu outlined the Ten Basic Tenets of Taijiquan. Though his formulation of these tenets postdated Chen-style taijiquan, they still apply to the earlier Chen style and to all styles subsequent to Yang Chengfu’s Yang style. These ten basic tenets are in essence a summary of the Taiji Classics. Styles vary in the depth of the stances, the size of the movements, flourishes, and the appearance of the release of power. In Chen style, for instance, emphasis is placed on the explosive release of power, referred to as fa jing. Despite these differences, the basic characteristics and tenets are a constant. Kicks tend to utilize the heel of the foot rather than the ball of the foot. Hand strikes more often employ the palm, compared with the fist in most hard styles. Though the fist is an important weapon in taijiquan as well, the fist is closed loosely. The theory is that energy gets locked up in a consistently tightly clenched fist and steals energy from the punch. The view is that for every show of strength, there is resultant weakness. For strikes, more of the body is employed in taijiquan. 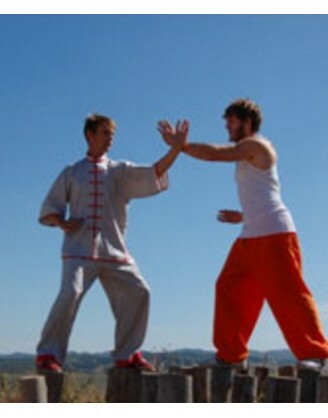 For example, one of the essential actions of taijiquan is kao (bump) energy. Utilizing this force, one may use the shoulder, back, entire torso, or hip as a weapon. Taijiquan was originally called the Thirteen Movements, but this does not refer to specific techniques of blocking or attacking. These are instead thought of more as eight energies and five directions. The energies are peng (ward off), lu (roll back), Ji (press), an (push), cat (pull down), lie (split), zhou (elbow), and kao (bump). The first four of these energies are referred to as the “essential energies.” The latter four are the “four corners,” referring to the directions of the compass, northeast, southeast, northwest, and southwest. The remaining five directions are advance, retreat, gaze right, look left, and central equilibrium. The jing (power) of these techniques is manifested by the propagation of qi (internal energy) from the ground, into the leg, gathered at the dan-tian, passing up through the spine, and then manifested out through the relaxed weapon, be it the hand, elbow, shoulder, sword, or other channel. This energy travels in a spiraling fashion, often referred to as silk-reeling. Ultimately, the body acts as a whip with the handle of the whip being the foot, rooted to the ground. This root, as it is called, is the foundation of a taijiquan practitioner’s stability or balance. It is accomplished by relaxing all of one’s weight into one of the lower extremities, thus allowing gravity to do the work of stabilizing the body. The Chinese character for song (relaxing) is best interpreted as “sinking.” It is by sinking into the lower extremity that root is established. The earth’s energy/force is then transmitted up through a point in the center bottom of the foot just behind the ball joint of the third toe, a point called the yong quan (bubbling well). Root is established by taking on the configuration of a triangle with its base on the ground; thus, the emphasis turns to developing the lower extremities, especially the thigh muscles. This is as opposed to external styles, where there is more emphasis on developing strength and power in the upper body. Though relaxing/sinking into a leg (a yin activity) may appear passive, it illustrates paradoxical concepts and realities working in conjunction with one another, so very typical of taijiquan, which has its origins in mystical Daoism. Sinking or relaxing into the leg is a physical metaphor of the spiritual concept of “action without action,” wuwei. Though there is no active muscle contraction when the player relaxes into the leg, the muscles of the leg are contracting on their own in a balanced and natural fashion, without conscious intent. Wuxin (no mind) is a core principle of all martial arts. The yin activity of sinking is counterbalanced by the yang activity of suspending the head. The result is stability elicited by the top of the spine being pulled up (to heaven) and the bottom of the spine pulled down (by the earth’s gravity). The spine then serves as an individual’s axis being pulled from above and from below, and from which all actions and forces emanate. The peng (ward-off) energy of taijiquan is construed by some as the most basic of all of the energies in the martial art, giving taijiquan its character. 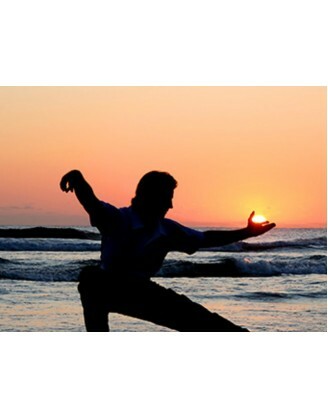 Peng energy distinguishes taijiquan from all of the martial arts in the external school. Master Hong Junsheng, a Chen stylist, states, “Taiji (Quan) is Peng Force” (Wu 2001). Taijiquan, contrasted to the external styles of martial art, is notable for its softness and roundness rather than a hard and linear character. Peng energy is expansive and round (like an inflating sphere), spiraling up from the ground. The energy spiraling up from the ground is accomplished by compressing into the yin leg, followed by decompressing the leg, as in the case of a wound-up spring being released. The energy is then transmitted, with the skeleton and its ligaments and joints serving as the conduit for the energy. It is the slight concavity of the chest with the upper back slightly rounded, along with the opening of the joints in the upper extremities, that gives the taijiquan player the sense of holding an expanding sphere. If someone were to push on or place the arms around someone exhibiting peng force, there would be the sense of contacting an inflated rubber ball. This force serves to deflect or bounce off incoming force. This is the nature of peng. In Daoism, it is said that from the wuji (Void) comes the One manifested creation—Taiji. The One begets the Two (yin and yang), and the Two beget the Three. From the Three come the Ten Thousand Things, the myriad of manifestations in creation, that is, the realm of all possibilities. In taijiquan the other action energies and applications of the various postures are to be viewed as points along a continuum of an infinite number of possible responses to an opponent. One is never committed to any particular action or application, and like water, one can change in an instant, depending on circumstances. Water—with its soft, formless nature—is considered by the Daoists to be the strongest force in nature, able to blend, following the path of least resistance, and to wear away even the hardest of objects without itself being harmed. 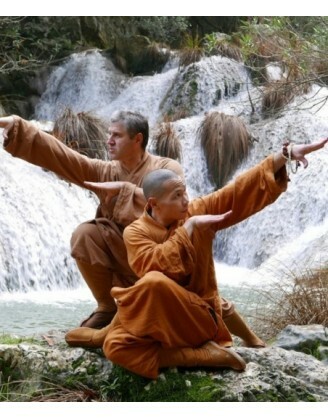 In metaphorical fashion, the taijiquan fighter strives to follow the example of water. The mainstay of partner practice is push-hands (tui shou), a type of sparring exercise. 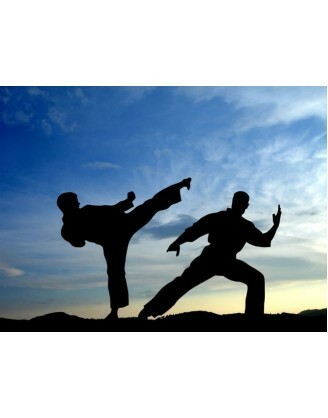 Kicking, punching, striking, and joint-locking, although implied, have been removed to eliminate serious injury. The setup of unbalancing, throwing down, or projecting the opponent away is emphasized and cultivated. 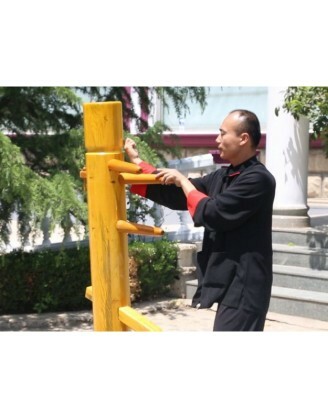 Because this safe method of martial skill development uses little space and no protective gear or special clothing, this martial art is easily pursued by two persons at any place and at any time. This practice may take many forms that range from quite fixed, gentle, and cooperative routines to an aggressive “freestyle” that may resemble smooth, standing forms of judo or wrestling. Initial training should always be cooperative, safe, and prearranged, and emphasize sensitivity and sticking to the partner’s movement. One learns to “feel” the partner’s force—whether it is weak or strong and where it is solid or empty—so that one may react properly, placing the partner at a disadvantage. Stationary Two-Hands. This deals with basic lead-hand pushing and neutralizing, coordinating hand pushes with body movement, especially from the waist. These are fairly square-on attacks. Four-Hands Practice, both stationary and stepping. This deals with the actions of peng (ward off), lu (roll back), Ji (press), and an (push), the first four of the eight energies previously mentioned. It is more difficult to learn, and more interesting to practice. Again, it develops skills against attacks from the front. Big Roll-Back (Da Lu) This deals with an opponent attacking from the corners, and is a method of practice of the other four of the eight energies: cai (pull down), lie (split), zhou (elbow), and kao (bump). Freestyle Push-Hands. This may also be done stationary or moving. It refers to a wide range of practice, from skilled players running through the previous routines in a spontaneous and lively manner to actual competition of unbalancing, projecting, and throwing down the opponent. Some schools, such as Chen style, practice a very vigorous, competitive form of this push-hands practice. Choreographed two-person sets are also considered a form of stepping push-hands. Some taiji schools include an intricate eighty-eight-movement set, some have shorter sets, and others have no choreographed sets, believing this to be an ineffective training method for the time involved in learning. By blending with the opponent and matching the opponent’s force, that is, by balancing yin and yang, the defender becomes one with the opponent. 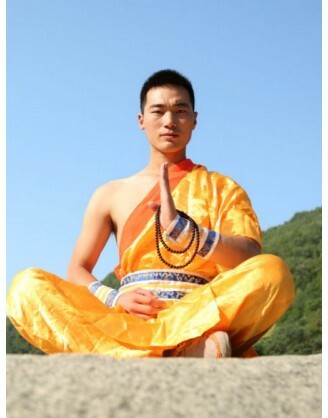 This is accomplished by zhan nianjin (sticking energy) and ting jin (listening energy). Utilizing these energies, a defender can sense what is going to happen before the actual occurrence. One is also then more sensitive to and more aware of the position and characteristics of one’s own body at any instant in time. The result is a state of pure awareness, and without judging the situation, one knows oneself and has knowledge of one’s opponent. As a function of push-hands practice, taijiquan emphasizes blending rather than speed, softness (“like steel wrapped in cotton”) and roundness rather than hardness and linearity. Change is harnessed rather than controlled and created. In taijiquan a defender uses the attacker’s force to unbalance the opponent, then strikes, pushes, or in other ways attacks the opponent. The taijiquan defender utilizes the aggressor’s energy against the aggressor by “enticing the opponent to advance, causing the opponent to fall into emptiness, uniting with the opponent, and then throwing the opponent out”—Yin jin, luo kong, he ji chu. Once an opponent enters into the defender’s space and finds momentum allowed to continue on, it is difficult for the opponent to change intent and action. The result is the aggressor becoming uncentered, uprooted, and off balance, allowing for defense with minimal effort: wuwei (effortless effort). With the arrival of morning light, tens of millions of Chinese head to parks and squares, by lakes, near trees, even in free spaces between buildings, to practice taijiquan, other styles of wushu, and qigong. It is a common sight for visitors to China, and one that is slowly becoming more common in the West, and not just in Chinatowns. The strikingly odd yet calming images of slow-moving groups in perfect synchrony have permeated the Western consciousness as well. Senior citizen centers, martial arts schools, and health clubs throughout North America are developing taijiquan programs. Even Madison Avenue advertising firms have recognized the power of taijiquan. Using images of taijiquan players in the background to attract our eye, they pitch their products in the foreground, even during the halftime of the heavily watched Superbowl. Yet, though we are exposed more and more, there is much confusion here in the West, and sometimes as much in the East. As taijiquan gains popularity as exercise, self-defense, and healing art, researchers in both the East and West are delving into the origins of the art, its healing nature, its martial nature, and the effects of practice. 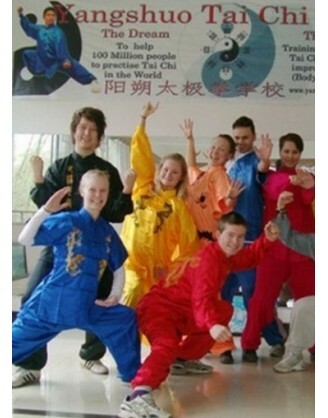 If you want to book and train any kind of Martial Arts around the world, please, choose only reliable and tested GYM's and camps, such as those listed at category Tai Chi. We collect and publish reviews about all camps and school around the world, if you want to write review about Tai Chi, please use tab Review in camp description block above.